If you came directly to this page from some other site, you should start on the home page or at least read the Triangulation Page first. Look at the section of map up above - you might find it useful to print that image and actually do these steps. Print the map and lay it on the floor. Orient the map for North right where you are and imagine that you can see mountains off in the distance. 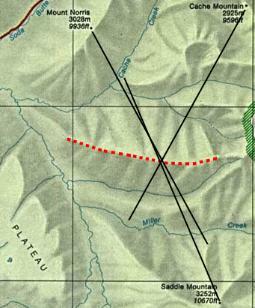 You have just climbed the highlighted ridge after fishing in Miller Creek. You do not know where along the ridge you are standing, but you can see 3 mountains off in the distance north and south. Notice that two bearings that are nearly opposite each other do not do a good job of triangulating. It is important to get another landmark at approximately right angles with one of your landmarks. 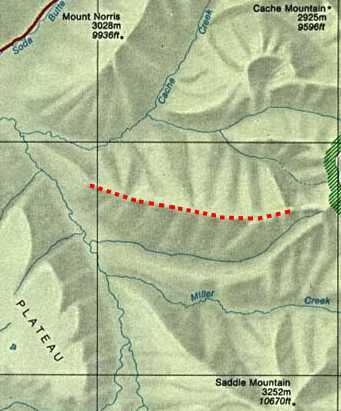 Mount Norris and Saddle Mountain have a wide possible intersection but Mount Norris and Cache Mountain have a much smaller intersection area.